We spent the weekend over the bridge in New Jersey with Robert's family. His mom has a really big gorgeous garden full of vegetables that we helped weed and get ready for planting. It's a short week for us with the holiday this weekend. It's the first 4 days we'll have off in quite a while, and after a lot of back and forth we finally decided we're just going to drive south towards the Chesapeake Bay on Friday and see where we end up. I got home last night and had an itch to make dessert with the apricots we picked up this weekend. Dessert on weeknights is rare, unless I've gone into a baking fit and decided that even though I'm already half asleep on the couch at 11 PM I absolutely have to make cookies. It's been a while since I made crêpes and they just sounded good. I didn't do anything fancy with the apricots, just sliced them in half and put a little bit of butter and brown sugar on top of each one. The roasting really brings out the sweet flavor and makes them soft enough to roll up in the crepe. Preheat oven to 400°. Place sliced apricots on a baking sheet or small roasting pan, top with butter and a sprinkle of brown sugar. Bake for about 20 minutes, or until the edges are browned and the apricots are soft. Using a mixer or whisk, combine all ingredients until completely smooth. Prepare an 8" skillet over medium heat with cooking spray. Pour the batter onto the skillet about 3 tablespoons at a time to create a thin and even layer across the pan. Once the sides are browning and curling up, flip the crepe and finish cooking on the other side. 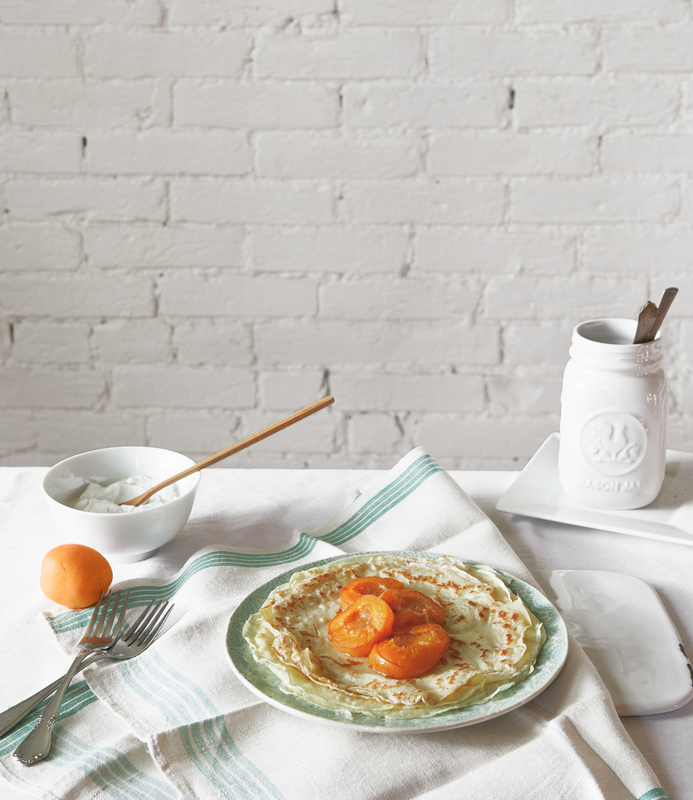 Serve warm with a layer of greek yogurt, topped with roasted apricots.